All the control in just one remote. Never have a pile of assorted remotes again. Enjoy a single command center with a wireless touch panel that automatically dims the lights, draws the drapes, lowers the screen and projector, and even starts playing your movie. And, if you are in the middle of the big game, you can check the camera at the front door for late arriving sports fans without having to leave your seat. We provide home automation systems that give you full control over your entire audio/video system from a single location. Using products from popular home automation companies, we’ll customize a convenient, easy-to-use system for you. The possibilities are endless. Our integrated lighting control solutions – including motorized shades add beauty, convenience, and comfort to the home. Even better, they lower utility bills and increase the home’s value and security. Lighting control and motorized shades solutions deliver precise, super-quiet one-touch control of electric and natural light. Cresnet® low voltage wiring and/or RF control can be used throughout a wide range of system design scenarios, including traditional wiring with local intelligence or distributed, high voltage wiring with centralized and/or distributed intelligence systems. 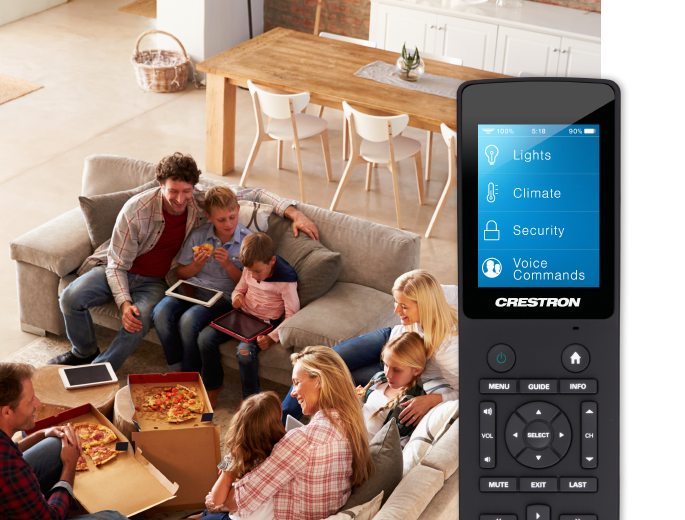 Crestron infiNET™ wireless devices provide a simple retrofit solution to expand existing systems. There is no limit to the number or types of devices; the system can grow as needed to accommodate any last minute changes or new additions. 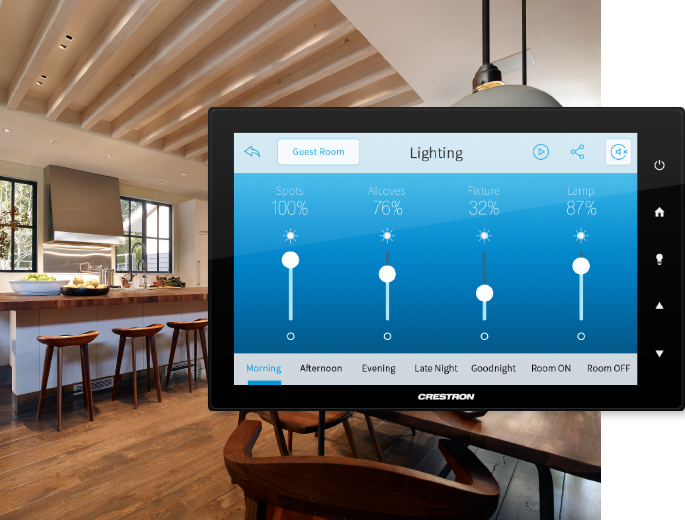 Crestron products allow the designer to continually expand and change any lighting system. If you would like to find out how Kiwi Audio Visual can help you install lighting control or motorized shades, please email us at info(at)kiwiav(dot)com or call 888-567-5494. Lighting control and motorized shades are a trending home technology must-have in 2015. Find out why with Kiwi Audio Visual. With a telephone system controller and modern handsets you can have all the convenience and features of your office phone system, at home. Place calls on hold, transfer calls between rooms, call from one room to another, answer the doorbell from any phone in the house, or forward calls to your cell phone. Better yet, we’ll connect your phones into your home theatre automation system so you won’t be disturbed during a romantic movie or exciting sporting event unless it’s important. Through a variety of telephone styles, from desktop units with LCD screens to portable models you can take outdoors, you can easily manage multiple lines and decide what calls get through. Crestron is the world’s leading manufacturer of advanced control and automation systems, innovating technology and reinventing the way people live. Kiwi Audio Visual relies on Crestron as the backbone for all your Total Home Technology needs. The system allows individuals to create a comfortable environment, set a mood, and enjoy technology all by way of brilliantly intuitive and customized interfaces. These interfaces range from large 17″ touchscreens to wireless handheld remotes all placed strategically throughout. Kiwi Audio Visual can design and install a Crestron system that will improve the quality of life for you in your home.